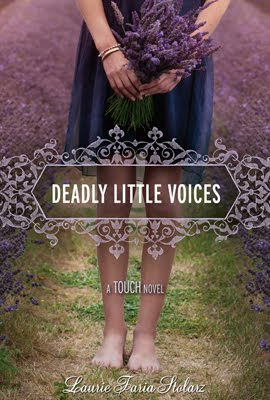 Seeing the future isn’t all it’s cracked up to be according to the latest installment in GCC Member Laurie Faria Stolarz’s YA series, DEADLY LITTLE VOICES, out this month through Disney/Hyperion Books for Children. I must say that the covers for this series are gorgeous! Love them, love them! Camelia Hammond thought her powers of psychometry gave her only the ability to sense the future through touch. But now she’s started to hear voices. Cruel voices. Berating her, telling her how ugly she is, that she has no talent, and that she’d be better off dead. Camelia is terrified for her mental stability, especially since her deranged aunt with a suicidal history, has just moved into the house. As if all of that weren’t torturing enough, Camelia’s ex-boyfriend, Ben, for whom she still harbors feelings and who has similar psychometric abilities, has started seeing someone else. Even her closest friends, Kimmie and Wes, are unsure how to handle her erratic behavior. With the line between reality and dream consistently blurred, Camelia turns to pottery to get a grip on her emotions. She begins sculpting a figure skater, only to receive frightening premonitions that someone’s in danger. But who is the intended victim? And how can Camelia help that person when she’s on the brink of losing her own sanity? Laurie: I’ve been a bridesmaid twice. The first time I wore a dress that was too big, the fabric of which (grayish-purple and super thick) reminded me of couch material. The second time, the dress was this horrible bright red, skin-tight, low-cut glossy-taffeta sheath that I could barely sit in. Laurie: I don’t base anything directly on my own personal background. Though, I do steal character quirks from others (or sometimes myself). For example, in the Blue is for Nightmares series, Amber carries around a pair of chopsticks for whenever she’s eating out. I once knew someone who did that. In the Touch series, Camelia’s mom is a vegan- raw-foods health nut and a touch of that comes from me. I’m nowhere near as crazed as Camelia’s mom, but I am vegan 98% of the time. Laurie: Finding an editor, for sure. I think it’s hard to find an agent when you haven’t been published before. So, I found an editor on my own. Once I had a couple deals behind me, it was much easier to find an agent. Laurie: I wanted to write a story where the main character has to struggle with the idea of falling in love with someone who could potentially be dangerous. I tinkered with this concept in the first three books of my Blue is for Nightmares Series [(Blue is for Nightmares (Llewellyn 2003), White is for Magic(Llewellyn 2004), and Silver is for Secrets (Llewellyn 2005), as well as in Bleed (Hyperion 2006)]. InBleed, in particular, there’s a young male character who was convicted for the murder of his girlfriend. His next relationship consists of pen pal letters he exchanges with a young girl while he’s in prison. Without giving too much away, the relationship is briefly pursued once he is released, but I wanted to bring this concept to another level. Additionally, I wanted to continue experimenting with the supernatural (which I also use in my Blue is for Nightmares Series as well as in Project 17), showing how we all have our own inner senses and intuition, and how with work we can tap into those senses and make them stronger. I started researching different types of supernatural powers and discovered the power of psychometry (the ability to sense things through touch). The concept fascinated me, and so I wanted to bring it out in a character, showing how sometimes even the most extraordinary powers can also be a curse. Lastly, I wanted to apply these concepts to be part of a series. I love the idea of growing main character over the course of several books. Thank you, Laurie! Now, everyone go out and buy books, lots and lots of books!